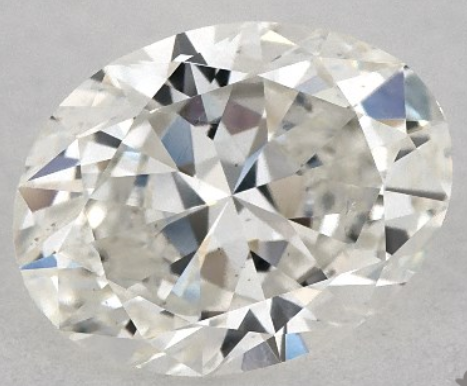 An oval diamond is a thing of unique beauty; unlike other diamond cuts, the complex nature of an oval diamond means it cannot be tied to specific parameters, nor can its beauty be determined on paper by proportions and percentages. A huge part of the joy when choosing an oval is that it will ultimately be down to the buyer to decide by eye which diamond is suitable. Often deemed one of the most flattering shapes for an engagement ring, an oval will appear larger than a round brilliant of equivalent carat weight and gives an elegant, slimming effect to the hand. It offers brilliance and fire in abundance both as a solitaire and when enhanced with a halo. While there is freedom to be had when choosing an oval diamond, there are still guidelines to follow to ensure you are getting the most out of this delicate and impressive diamond. 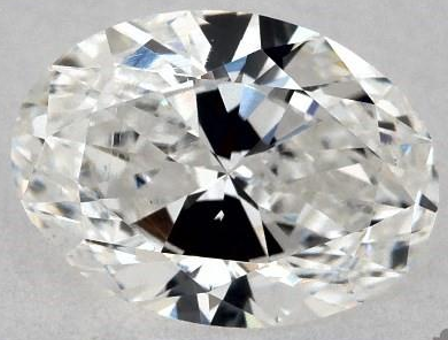 As I mentioned before, determining the cut quality is not so simple in an oval diamond. However, that does not mean that this crucial factor should be overlooked. The GIA does not offer cut grading for an oval diamond, but certification is still absolutely essential, as color and clarity will still play a large role in the price and beauty of the stone. You may be offered rough parameters as you research oval diamonds, but I advise caution when looking at these. There are no standard proportions for an oval diamond, therefore, any specifications that you find will be widely subjective. Some oval diamonds will be long, narrow, and slender, while others will be rounder in appearance. There are no rules when it comes to the length/width ratio, it is entirely based on your personal preferences, although 1.35-1.50 is considered the ratio for a classic oval cut. James Allen has a huge selection of Oval Cut Diamonds as has Blue Nile. If you’re considering a princess cut or round cut diamond however head to Whiteflash and look at their A CUT ABOVE line. If you are choosing a platinum or white gold setting, I would recommend a minimum of a H in color. Falling just outside the ‘colorless’ bracket of grading, an H will usually carry a considerably lower price than a G, with very little difference to the naked eye. For warmer settings such as yellow and rose gold, anything from a J or above would be acceptable. An oval diamond is extremely forgiving. Inclusions and marks towards the edge of the stone will be difficult to detect by eye, and the facets will also work to minimize the appearance of any flaws. For this reason, you can find some stunning oval diamonds at an SI1 or SI1 clarity grade. It is still important to thoroughly check the diamond, as an inclusion close to the surface in the center of the diamond will detract from its beauty. Oval diamonds can sometimes feature a visual trait know as the bow-tie effect. This describes a dark space, like a shadow, casting across the center of the stone. Below is an example of an oval diamond displaying the bow-tie effect. 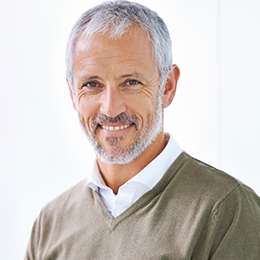 While a small amount of shadowing is normal, a prominent bow-tie should be avoided as it detracts from the beauty and sparkle of the diamond. This diamond however does not display the bowtie effect – when compared side by side the dominance of this visual occurrence becomes clear. Be sure to keep this in mind when looking for an oval diamond. An oval naturally lends itself to a variety of settings and can be used to create a vintage look just as easily as it can conjure a sleek, modern engagement ring. 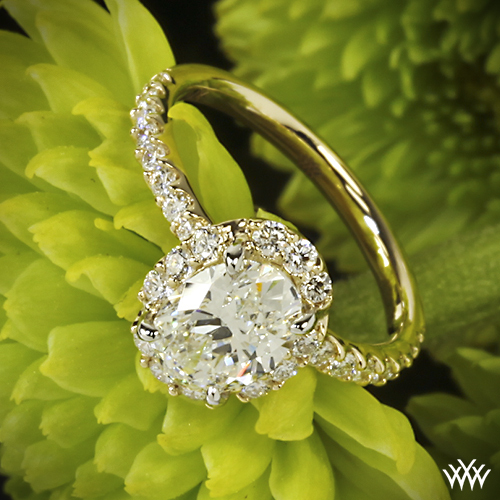 This Whiteflash ring presents the oval in a pave halo, finished on a pave band. The yellow gold adds a soft, warm tone to the ring, while the halo helps to enhance the elongated effect created by an oval shape diamond. 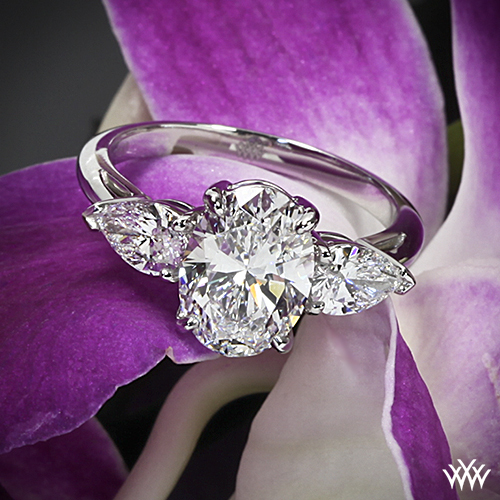 This engagement ring utilizes two pear cut side stones to create a winged or petal-like illusions. It is the perfect example of two unique cuts of diamond being used in harmony to create a balanced, contemporary piece of stand-out jewelry. The oval is set slightly higher than the side stones, giving this stunning diamond the prominence that it deserves. Oval diamonds are beautiful as stand-alone solitaires, but are also the perfect partner to halos, colored gemstones, and sides-stones. The rounded edges minimize the chances of chipping or catching your diamond, making them an excellent choice for an engagement ring. There is an element of freedom when choosing an oval diamond, however, be sure to pay close attention to the color and clarity to ensure the best possible performance from your stone. If you’re looking to purchase an Oval diamond and setting I would recommenced reading my reviews on James Allen, Blue Nile and also Whiteflash.